Do you want to get more blogging traffic from Pinterest? As a beginner blogger, it can be hard to grow your blog traffic. 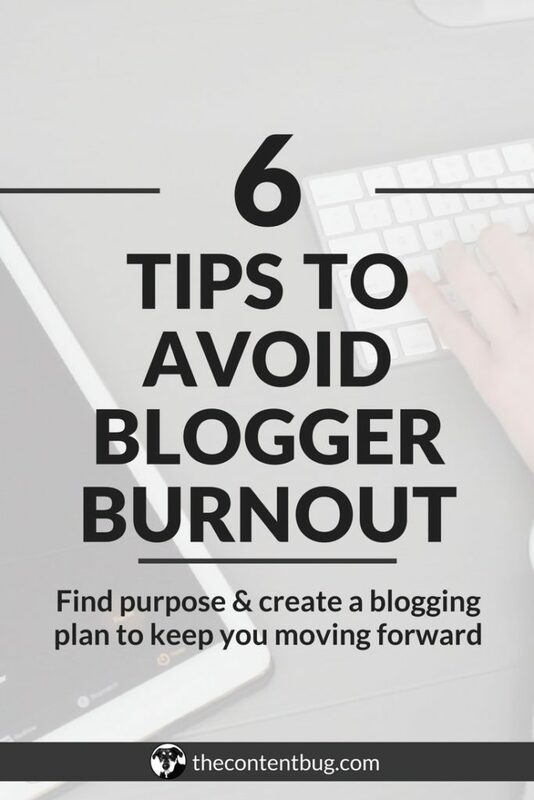 You can read all the tips and tricks provided by other bloggers, but the more work you do the less it seems to work. Why? Because trying 100 different strategies is much worse than trying 1 that works. So today, I want to talk all about Pinterest. At this point, you probably already know that most bloggers use Pinterest as their secret weapon to drive traffic to their blogs. It’s nothing new. We haven’t stumbled upon the next greatest thing here. Pinterest isn’t just another social media platform. It’s not like Instagram and Facebook where you go to connect with people. Pinterest is actually a search engine. Yeah. Again… this isn’t breaking news or anything. Pinterest is just like Google. People go to the platform to search for things. And if your blog is the answer to the thing that they are searching for, then you can start to really grow your blog traffic. 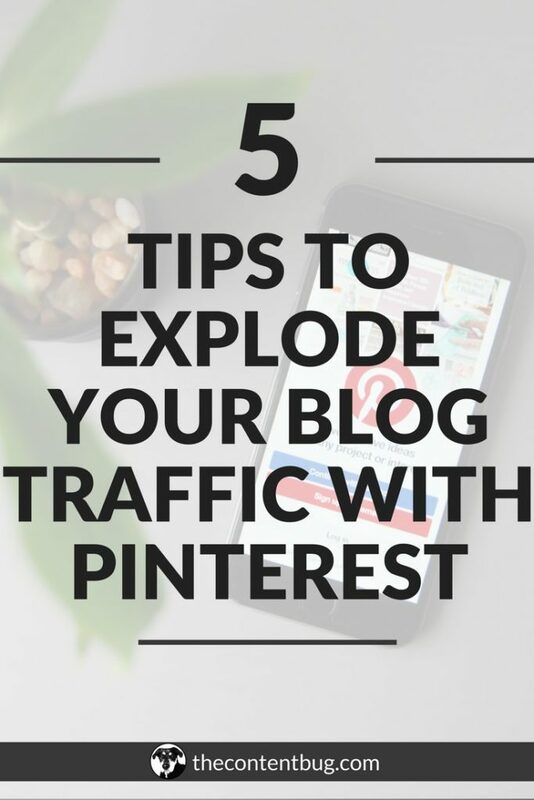 Well, that’s where these 5 tips to explode your blog traffic with Pinterest begin. Let’s get started. If you are a brand new to the world of Pinterest, then listen up! These 5 tips aren’t a complete strategy. You can’t just start using these 5 tips and expect that your Pinterest account will magically start generating 10k page views to your blog a month. You need to have a Pinterest business account and Rich Pins for your website. You need to have the proper Pinterest SEO in place. You need to have at least 25 boards, you need to be using group boards, and you need to share at least 30 pins a day. And don’t forget that you need to niche down and share content that is relevant so you are reaching the right audience. There is a lot that you need to worry about when you are setting your Pinterest account up for success. And lucky for you, I’ve written several blog posts about Pinterest to get your account where it needs to be. Now it’s time to get to the good stuff. Here are the 5 tips that will take your Pinterest strategy to the next level! 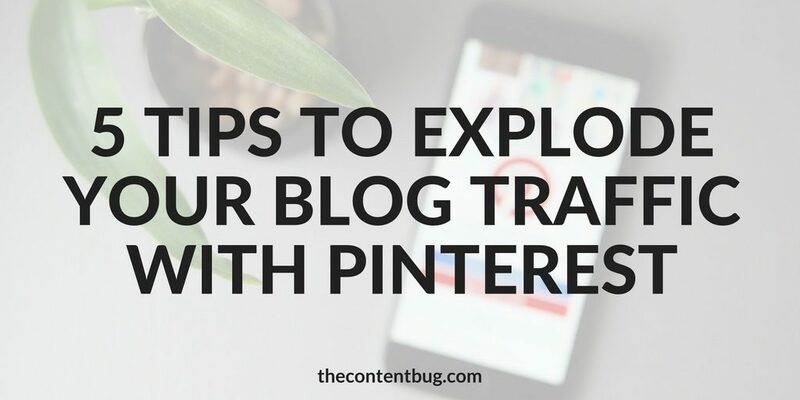 I’m hoping that you already knew that you need to be pinning your blog posts to Pinterest. But did you know that you can also pin content from other sources… such as Instagram? This is more of a tip for food bloggers, lifestyle bloggers, beauty bloggers, fashion bloggers, etc. If you are the type of blogger who’s Instagram account is just as important as your blog, then you’ll want to pin your Instagram photos. But that’s not all that you want to pin! If you really want to drive website traffic with Pinterest, then you need to pin your landing pages and other pages on your website. Simply create specialize graphics for the page you are linking to and share them! You might be surprised how this could grow not only your blog traffic but also your Instagram account and email list! I recently started pinning my YouTube videos too and so far I’ve seen great results! If you want to take your Pinterest account seriously, then you need to be pinning 30 to 50 times a day. And if you don’t have an automation platform in place, you could be spending hours on Pinterest daily! I spend 1 hour a week on Tailwind scheduling over 400 pins to be shared over the next 7 days. Tailwind not only saves me several hours each week, but they also tell me when I need to be posting so that I’m only sharing pins at the best times. But with Tailwind or any other scheduler, this isn’t a complete set it and leave it strategy. If you’ve been using an automation platform for your Pinterest account and haven’t pinned manually recently, you may notice that your Pinterest analytics haven’t been performing as well. Recently, Pinterest changed their algorithm to reward people who are actually on the Pinterest platform and pinning manually! Those who only rely on their automation system may notice a decrease in their visibility. So while pin schedulers like Tailwind are great to keep your account active on a daily basis, you still need to be visiting the platform at least 3 times a week to share some pins manually to keep Pinterest happy! Since Pinterest is a search engine, you need to treat it like one by performing keyword research. When you perform keyword research, you get to see what people are searching the platform for. When you know what people are searching Pinterest for, then you can tailor the content you write/share to include those keywords. And in time, you’ll start to appear for those keywords and dramatically improve your visibility. Keywords should be placed in your profile name, profile description, board titles, board descriptions, pin titles, pin descriptions, and in the actual content of your blog posts that you are sharing. If you want to learn more about how to perform keyword research, watch the video below. The key to your success on Pinterest could come down to the design of your pins. So you need to take the time to create amazing pin worthy graphics for your blog posts, landing pages, and other website pages that you want to share. It’s important to remember that your graphics need to be easy to read and pass the squinting test. Squinting test: If you have to squint and move your face closer to the screen to clearly read the pin, then the text needs to be fixed. That could mean changing the size, font, or color. Second, if you squint really hard from a distance and can’t read some of the words on the pin, then the text needs to be changed. This second test is typically a problem when it comes to cursives. So be careful of that. But these days, it’s not enough to create 1 pin for each blog posts. Instead, it’s recommended that you create multiple! Personally… I don’t use this strategy. I’ve mixed up my brand pins a couple times now to tweak them to perform better. And I’m at a point where I’m really happy with my pins! If you still aren’t sure on how to design your brand pin, I would recommend creating 3 pins per blog post. Pin all of them to Pinterest, and after 2 weeks, see what pins are performing the best. PRO-TIP: If you use Tailwind, this is where Tailwind Tribes can come in handy. Simply pin your 3 graphics there and see what one performs the best in a day or two. This will give you a quick insight into what design works and what one doesn’t. This is also a great strategy for food and fashion bloggers! Share several images that you include in your blog post linking to the post. It increases your chances of getting more website traffic! This should be a duh. But there is something really important here. When it comes to creating pin-worthy content (specifically talking about blog posts) there is a lot that you have to take into consideration. You need to pay attention to the first 50 words of your blog post. So the very first few paragraphs, what content did you include. Did you make it interesting enough to make the audience want to keep reading? Did you include questions to get them thinking? Did you include important keywords? Did you include your affiliate disclosure? The very first 50 words or so will appear on Pinterest! So this section is critical to your success. If you start out with your affiliate disclosure, you’ll lose your audience before they even click on your pin. This is the perfect place to include keywords and think in the mind of your reader. What would they be searching Pinterest for to find your blog post? Start there. Your content needs to be dressed to impress. That means breaking it up into sections. Including headings (H2 and H3 tags), images, and other appealing add-ons. PLUS sharing content that is over 1,500 words. You don’t want someone to land on your website and then leave automatically because it’s unappealing or it doesn’t provide them with the information they were looking for. If those 5 tips weren’t enough for ya, here’s some extra pointers to really improve your Pinterest strategy! With a Pinterest business account and a verified domain, your Pinterest profile will automatically have your blog’s link included. But if you want to take it a step further, you need to include a call to action at the end fo your account profile to lead them to an intended landing page. This is a great way to capture leads and grow your email list! Over time, pins can turn stale. And if you have several of the same pin, it’s important to delete the ones that don’t have any re-pins and keep the ones that have performed well. The pins that haven’t receive much engagement are just dead weight bringing your down! By deleting them, you improve your overall pin engagement. Did you know that you can now archive your boards? It’s similar to secret boards except when you archive them, you aren’t allowed to pin on them anymore. In the past, I would recommend for you to make the boards that don’t fall in your niche secret so you still have access to them but they don’t affect your Pinterest profile… but that’s not the case anymore. Secret boards are actually included in the algorithm by affecting your board engagement level. This takes into consideration how much you are pinning to your active boards as well as your secret boards! So if you have secret boards that you no longer pin to regularly, they are dead weight to your account bringing your visibility down! It’s better to archive those boards. You can still access them in the future to get to the pins you saved. You just can’t add pins to them anymore. Similar to pinning manually on the platform, you need to also be following new accounts! The more you engage with the platform, the more Pinterest is going to reward you. So try to follow new people every week and weed out the accounts you follow that aren’t active anymore. Yep… Pinterest has hashtags. This is a great addition to any pin description to add important keywords and categorize your blog posts with other similar content! Just like Instagram, hashtags on Pinterest improve your visibility. If you are just as fascinated about Pinterest as I am and you want to learn everything there is to know on how to drive some serious traffic to your website, make sure you watch my TCB Master Class below! But that’s not all I’ve got for you. 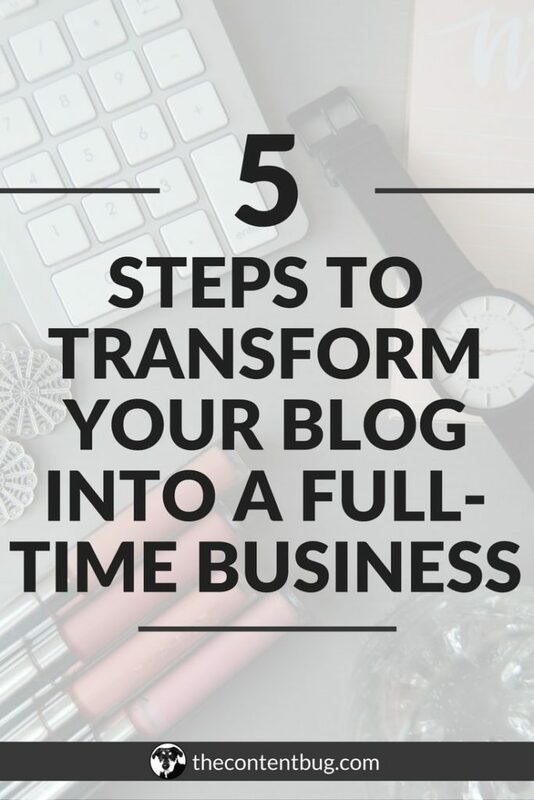 That you could create a plan that is guaranteed to help your blog grow? And what if I told you that people have already done it with The Blog Biz Bundle?! So what do you say? Do you actually want to grow your blog or continue trying all the strategies you find on Pinterest? I can’t wait to watch your blog grow in the next 90 days with The Blog Biz Bundle. Do you know what you’re doing right and what you’re doing wrong within your Pinterest strategy? Let me perform a Pinterest evaluation to help you get your Pinterest presence where it needs to be! Simply send me an email at thecontentbug@gmail.com or find out more information here! 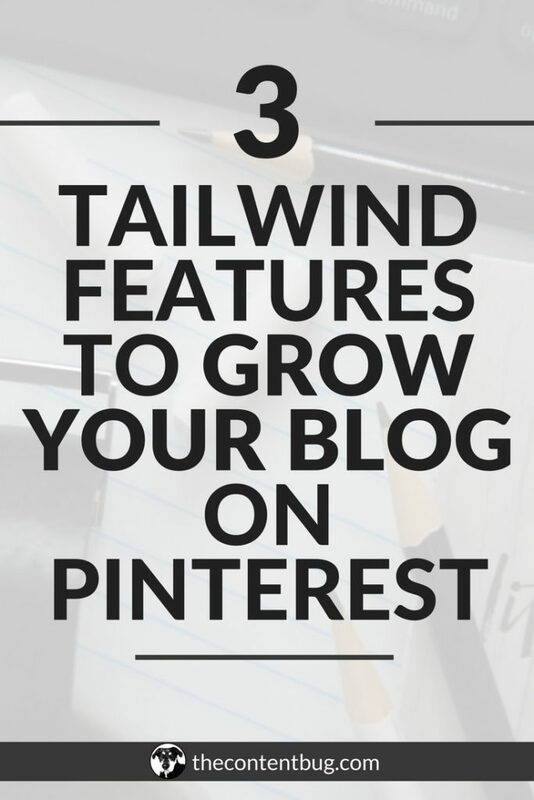 I do have an affiliate link for Tailwind! It is actually included above when I talk about them, but you can also click here to sign up!